Vientiane has been continuously inhabited since the 10th century. The Khmer, Siamese, Burmese and Vietnamese have all governed at one time or other, repeatedly conquering and often sacking the city even after it had been integrated into the first Lao kingdom known as Lan Xang, meaning the 'Land of a Million Elephants'. Vientiane reached a new height of importance in 1560, when King Setthathirath relocated his capital from Luang Prabang in the north to present-day Vientiane. 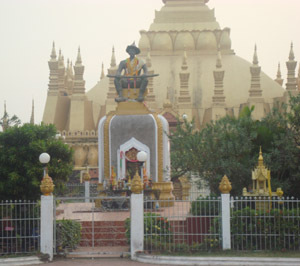 He built the impressive That Luang stupa on the site of an ancient Khmer temple east of the city. This Buddhist icon remains a major symbol in Laos and is an important centre for major Buddhist festivals. Vientiane suffered in the late 1800s when the Siamese razed the city. Only one Buddhist temple was left standing, Wat Sisaket, built in 1818. All but abandoned until the late 19th century, when the French colonised Laos as part of their Indochina plan, Vientiane has been on a slow path of recovery ever since. The French made Vientiane the capital of their new colony and most of the city today dates from this period or later. Many temples have been rebuilt and are now an integral part of daily life. Today the city is a mixture of old and new as it undergoes rapid development into a modern city. In 2010 Vientiane will celebrate its 450th birthday.